The ability to visually engage and attract customers through the retail experience is paramount to the success of any store. From the retro neon of a Fifties’ diner to the subtle earth-toned hues of Starbucks or the chalk drawn farm-stand appeal of Whole Foods Market, in an increasingly visual world, signage can be as important to the buying decision as the product itself. 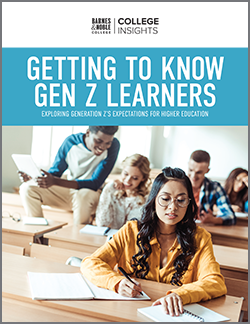 And if those famous disrupters, the Millennials, have changed the shopping experience, a new demographic on campus, Generation Z, is likely to also have their own take on what attracts and keeps their interest. 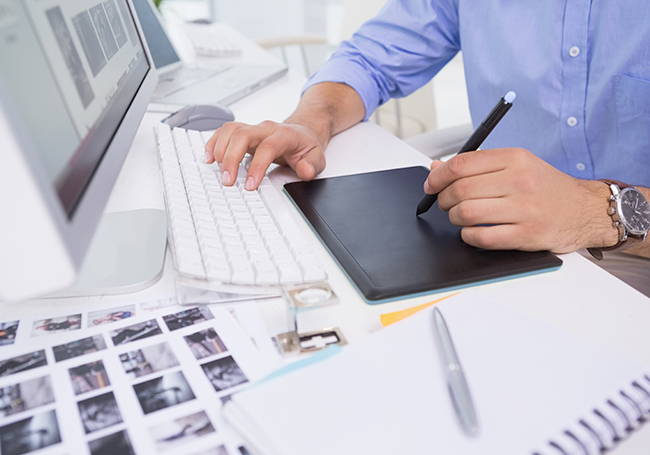 For a culture that’s maxed out on social media and visual distractions; it takes a talented creative team to design eye-catching marketing materials. Which is perhaps why Ryan Huhn and Hillary Dadouris recently spent some time at the mall and Barnes & Noble College bookstores — not to shop — but to watch how everyone else does. As graphic artists for Barnes & Noble College, Huhn and Dadouris are keenly interested in what attracts young consumers and how best they might help them find what they’re looking for in their campus bookstores. “We’ll start to think about a promotion a season ahead,” explains Huhn. “There’s a lead-in time to think through the approach — what the promotion might look like — and get all the materials prepared and sent to the store, and ready to go for a specific event,” he says. With 770 stores, and armed with a giant database of school branded logos and colors, the design team’s goal is to make their work as custom, yet universal, as possible. “It’s important to understand that each event is unique to that store,” Huhn says. “Stores like Tidewater [Community College], which is in a large retail mall location, will have different needs than a stadium store location, serving sports fans during a big football game,” he explains. Dadouris also acknowledges there is the need to respond to special events and requests as well. 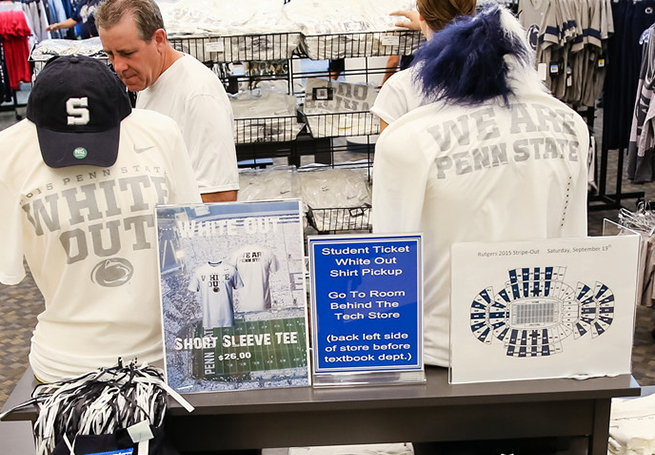 “For the Penn State Stripe Out game, for example, we took over the entire website with completely custom assets, along with coordinating store signage — and the email marketing campaign that supported it,” she says. 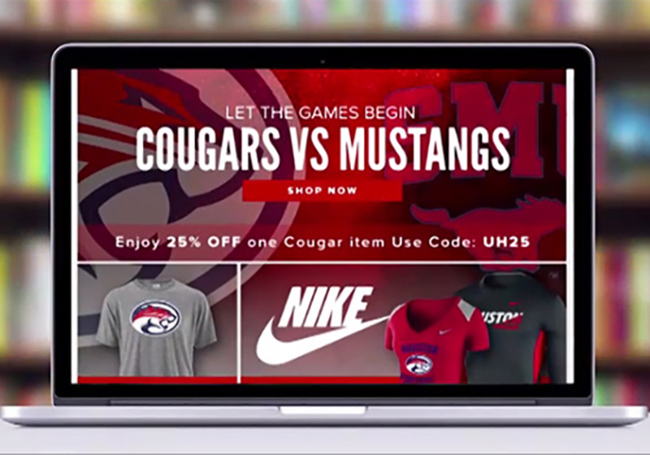 The design team also responds to important athletic events such as winning a national championship or a bowl win, which includes designing digital assets, custom to the school brand, and highlighting custom products, which is immediately deployed through social media, email and web ads. There are also different audiences to consider. 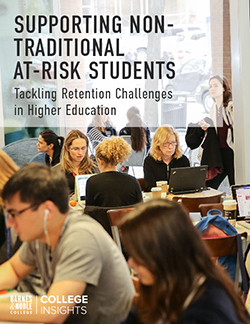 Increasingly, campuses are attracting ESL students, where the English language and imagery might not be so readily understood and consequently, the copy used to reach them needs to be clear and unambiguous — and the graphic treatment more reliant on icons than lifestyle imagery.